Three months I waited for these. 3 frickin' months! Calling the Mac stores every week since the lippies launched everywhere else =D. I called....and I called....and I called.....Then I got a definite (I hope that it's 100% though) answer. Oh, 11th June come sooner! The 2nd MAC lippiee is wanted by everyone! It keeps on running out and they should restock it asap. 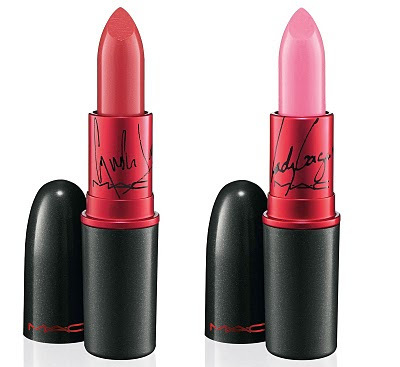 I'm a huge fan of Cindy Lauper but I like the lady gaga lipstick color more! you're one of the few people in india who will be able to pull off the lady gaga one! waiting for the pics! he he.. 2 of each !!!! @Rajni..I know! Damn late they have my no..but never get sms. I check on that next time. Thanks! Yay! Good luck with getting your hands on them. I can't believe they're taking so long to launch it in India!